Every bit of help team parents provide allows coaches to focus on their most important job: coaching. If you’ve taken on this task for the team, try some of these ideas for a winning season. Plan a Pre-season Meeting - Help parents and players know what to expect and get a idea of how many volunteers you will have to help determine your future activities. 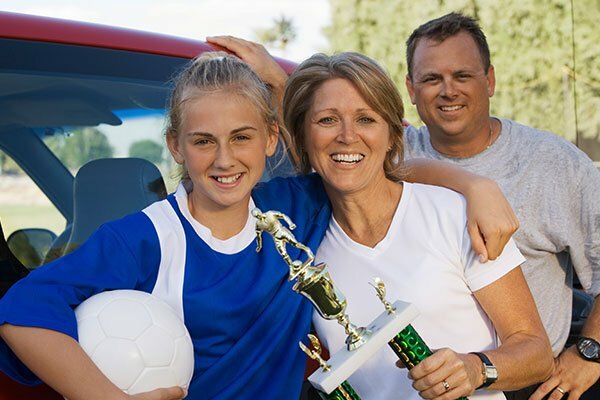 Depending on your sport and season, include discussions on snack schedules, concession stand coverage, carpools to away games and any scorekeeping needs. Outline Costs at the Outset - Consider gifts, photos, party planning and extra treats to help give parents a realistic idea of what they can expect. Some teams find that it helps to estimate all those costs in the beginning and have parents pay one larger fee up front instead of going back for each new cost. Either way, it’s best to communicate the team’s financial needs in the beginning. Genius Tip: Collect team dues and other fees directly on your sign up with SignUpGenius Payments. Communicate Often - Reminders never hurt, and with many parents juggling multiple extracurricular schedules, it’s a good idea to send out reminder emails about game and practice schedules. If done with regularity, parents will get accustomed to checking for any last-minute updates or changes. Coordinate game day snacks with an online sign up! SAMPLE. Keep Your Lists and Schedules Up to Date - Always have a master copy available — or have easy access to it — if needed for a last-minute update (or if you’re anxiously waiting a tardy player to arrive). Spearhead Fundraising – If you’re coordinating for a select or school team, this is more likely to come into play. Fundraising can help your players raise money for travel games, extra equipment, tournament fees and more. Genius Tip: Check out these 25 unique youth sports fundraising ideas. Never Underestimate the Power of Food - Coordinating this endeavor may be your most important duty. Be sure to provide reminders to parents the week or practice before their snack duty. Provide a list of healthy snack ideas at the beginning of the season and make sure to check on any food allergies. Plan a Few Unexpected Treats - There are often parents who would love to help out with planning an extra pre-game or pre-practice snack for those days when the schedule falls at an unusual time. Surprise pre-game treat bags with motivating notes, personalized water bottles or other fun items can also do a lot for team spirit. Organize Team Dinners – These are fun to organize at least a couple of times a year to promote team bonding off the field. Approach parents early in the season to see who might be open to hosting. And don’t forget to get inspiration from these 25 easy team meal ideas. Be an Excellent Head Cheerleader - Create a positive atmosphere by encouraging team members and parents to cheer for every player, not just their own kids or the star players. Some teams choose to purchase or create a team banner or flag, and if there’s a team sponsor, see if they will cover the cost. Make Sure to Record the Memories - That doesn’t mean it has to be you taking every picture every game. Consider assigning photo duty to different parents throughout the season, and then create a great way to share those photos later, whether it’s a slide show, album or website. As team parent, you are also likely to be in charge of coordinating team picture day. Make sure to start planning that day early and have plenty of extra order forms available. Be Prepared for as Many Unexpected Situations as Possible - As the team parent, the team will often look to you first for a solution. It’s a good idea to bring a fully stocked first aid kit, sunscreen, insect repellent and perhaps some extra socks to games and practices. Don’t forget to have a process in place if injuries occur. Collect supplies and food for an end-of-season party with a sign up! SAMPLE. Understand All Team Regulations from the Beginning - Sometimes team parents need to have a copy of each player’s birth certificate on file in case there are any discrepancies. Make sure you are informed of all needed paperwork and team parent duties at the beginning of the season. Don’t Do it All Yourself - Even if you could, it simply doesn’t promote team involvement. Create a variety of smaller tasks, along with the more time-consuming ones, to get as many parents involved as possible. 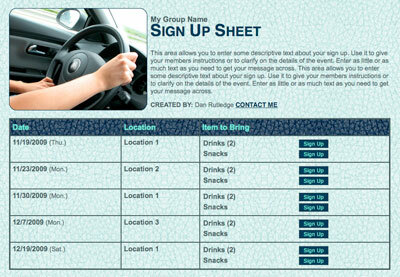 Genius Tip: Schedule volunteers and tasks using SignUpGenius for everything from snack duty to carpools for away games. Start Planning the End-of-Season Party Early - Enlist help from other parents and get their ideas and input, so they can be invested. One key decision will be whether to have a team family host at their house or head to a local restaurant or other venue. Promote Coach Appreciation - Coaches have made a huge time commitment on behalf of your team, and teaching kids the importance of respect and appreciation is so important. Plan an end-of-the-year gift and find ways to make it personal from the kids, such as handmade cards and notes. Genius Tip: Try one of these 40 gift ideas for coaches and team parents. The sports season doesn’t have to be stressful. Focus on organization up front and you’ll be reaping rewards in the months to come. Coordinate game day snacks with an online sign up. I can't tell you how much I love your site! I coach two different swim teams and have hundreds of volunteers needed to run my summer league. This is going to save so many people time! I have spent weeks looking for something just like this, simple yet affective. I look forward to using it over and over!